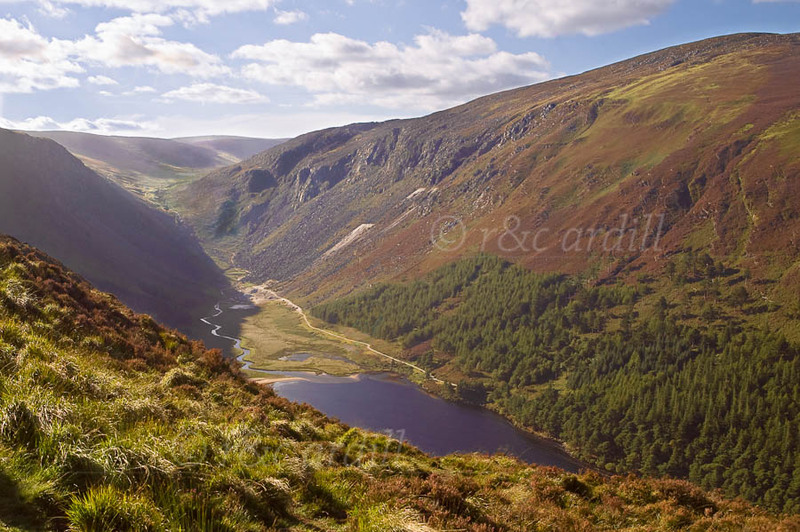 Photo of: East Coast of Ireland: Wicklow: Glendalough. This is a view of the Upper Lake at Glendalough taken from above the Miner's Village. There is a wonderful walk from the bottom of the lake (far distance) to the spot where this image was taken, then up further and round over the hills to the right of the image. This is a good 4-hour walk but the views are breathtaking! Glendalough (meaning Glen of the Two Lakes in Irish) is a famous site both because of its beauty and because of its ancient monastic site which includes a fine round tower and several churches. It was founded by St Kevin the 6th Century AD.